STANDINGS - RESULTS | 1ª DIV. GALLEGA FEM. Eneko Boveda (Bilbao, 14 December 1988) passed his medical at HM Modelo Hospital in a Coruña today, after signing his contract and becoming and RC Deportivo player. 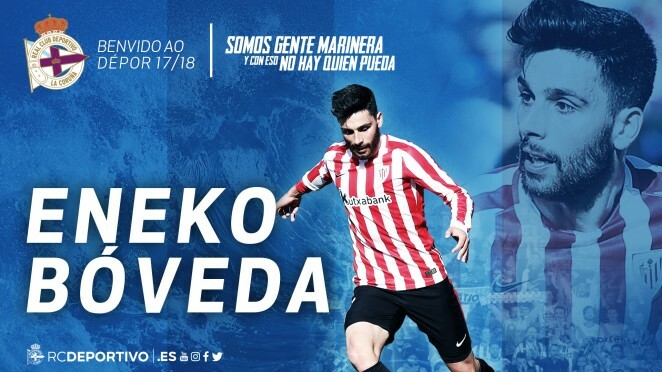 Our new Deportivista right-back has played 59 matches for Bilbao Athletic, over a hundred games for SD Eibar from 2011 to 2015, and over fifty games for Athletic Club since he returned to the first team two and a half years ago. He will train with his new teammates in Abegondo tomorrow. At the end of the training session, Eneko Boveda will give a press conference in Abegondo’s press room. Boveda reminded everyone "we're practically building a new team, with a different system"